Posted by Sapphire. February 7th 2019. Valentine’s Day is just around the corner. That means it’s the perfect time to start thinking about how you plan on showing your dog some extra love and just how much you appreciate them! Your dog probably loves nothing more than a brand new toy to play with. Whether it’s a cuddly teddy or a tennis ball, they can’t get enough! The Nerf Dog Tennis Ball Blaster is the perfect gift for all tennis ball-mad dogs (and we know there’s plenty of them!). With this toy, your dog’s tennis ball is launched over 50ft into the air, keeping them entertained with fetching the ball, as well as ensuring your dog gets some well deserved exercise too. Alternatively, there’s the PetSafe Ball Launcher which has nine distance settings meaning it can be used both indoors and outdoors. It also has an in-built automatic rest mode which ensures your dog doesn’t get overworked. It goes without saying that food always goes down well with your dog. But how about giving them an extra little something? One treat we recommend is Pedigree DentaStix. Your dog may not consider a toothbrush the best Valentine’s present… But these chews are good for your dog’s teeth, reducing tartar build-up by up to 80%. Plus, they’re low in fat, have no added sugar and are free from artificial colours and flavours – and your dog will also love them! If you want to go all out with the treating your dog, how about the challenge of creating your own tasty treats? Perfect if you need treats suitable for dietary requirements. While treats can make a great gift for Valentine’s Day, they should be enjoyed as part of a healthy, balanced diet and not given in excessive quantities as too many can be unhealthy for your dog. Your dog’s sleep is important. Statistics indicate that dogs can spend up 14 hours a day snoozing! As the saying goes – let sleeping dogs lie. If it doesn’t already, it’s crucial that your dog has a designated place for sleeping. A dog bed is one potential option for ensuring your pooch is healthy and getting its forty winks. You can really treat your dog this Valentine’s Day with the Petface Ultimate Luxury Memory Foam Pet Bed. Not only does it have a removable cover, making it easy to wash, but it also has a non-slip backing, providing more comfort for your dog. Plus, its memory foam inside ensures extra comfort for your dog. For a more affordable option, there’s the Grey Cord Oval Pet Bed which is machine washable and also has having a reversible inner pad. If you don’t want to splash out on new toys and treats for your dog, there’s always the less expensive option. Walkies! 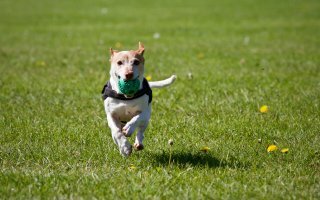 We know February weather isn’t always the nicest time of the year being outdoors, but outdoor adventures do have numerous health benefits for your dog. These include keeping your dog’s weight at a healthy level. Plus, a walk keeps your dog entertained as it sniffs and meets all the sights! To celebrate the day of love, how about taking a slightly different route you normally take with your dog so they know it’s an extra special day! Click here for more tips on on walking your dog in the winter months. The ultimate way to show your dog just how much you love them is by ensuring you have pet insurance, so they’re always protected should any problems arise. Visit www.argospetinsurance.co.uk to get a quote now.